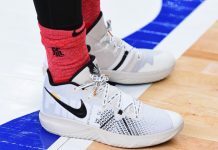 Kyrie Irving debuted his new budget sneaker known as the Nike Kyrie “Core” shoe during All-Stat Weekend with the help of Boston-based sneaker boutique Bodega. Much like Vans and Converse, Nike will also be using Toy Story characters onto Kyrie’s “Core” shoe with Woody (right shoe) and Buzz Lightyear (left shoe). In the video below by the Sneaker School YouTube channel, you can get more information on the new Nike “Core” shoe. A release date has yet to be announced, but you can expect more updates to come very soon. Let us know what you guys think of this new shoe in the comments section. The retail price tag is set at $80 USD.